Starbucks has planned an elaborate racial bias training session for its employees. On Tuesday afternoon, May 29, workers at each location will break into small groups to learn together. Starbucks CEO Kevin Johnson, Chairman Howard Schultz and musician and activist Common will serve as virtual guides. Employees will talk about their own experiences, and watch a film about bias. The company explained that each store will get a tool kit to help guide the trainings. The session will focus on understanding both racial bias and the history of racial discrimination in public spaces in the United States. About 175,000 workers will participate. The session will take place in stores and offices and about 8,000 company-owned stores will close for the event. More trainings will follow. The coffee chain announced the training session after two black men were arrested for trespassing in a Philadelphia Starbucks. A store manager called the police because the two men were sitting in the store without placing an order. The customers said they were waiting for another man to arrive. Starbucks CEO Kevin Johnson said that the training, among other efforts, will help make sure that nothing like the arrests will happen at a Starbucks again. "The incident has prompted us to reflect more deeply on all forms of bias, the role of our stores in communities and our responsibility to ensure that nothing like this happens again at Starbucks," Schultz said in an open letter to customers on Tuesday. "The reflection has led to a long-term commitment to reform systemwide policies, while elevating inclusion and equity in all we do." The letter ran as a full-page ad in the New York Times, USA Today and two Philadelphia papers. The company tapped several experts and researchers to help develop the curriculum, including Sherrilyn Ifill, president and director-counsel of the NAACP Legal Defense and Education Fund and Heather McGhee, president of the public policy organization Demos. Ifill and McGhee, who both served as unpaid advisers, told reporters on a media call on Thursday that they think Starbucks' plan is ambitious. They added that they will issue a report in the next few weeks outlining a comprehensive set of issues they believe the company must address. "We've made it clear that we won't be a rubber stamp to validate their programming," McGhee said. Ifill said that Starbucks management received a version of the bias training this week. The company said it will release training materials to the public next week, so others can use it. 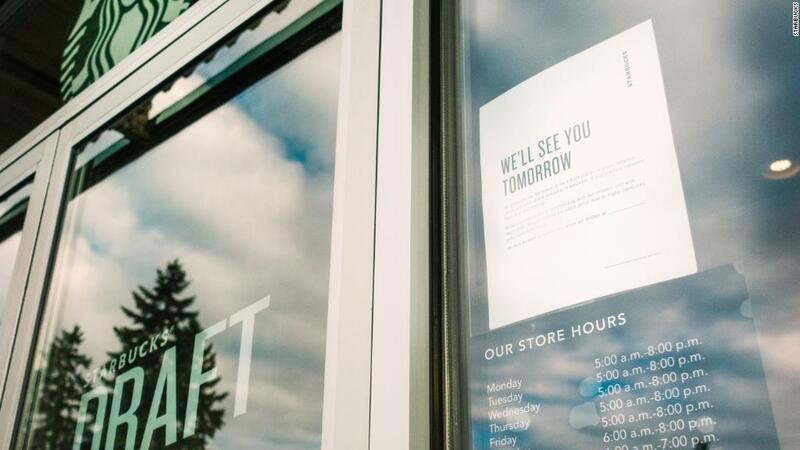 "Our hope is that these learning sessions and discussions will make a difference within and beyond our stores," Starbucks executive Rossan Williams told employees in a note on Wednesday. Starbucks recently changed its policy to allow people who haven't made a purchase to spend time in stores or use the bathroom. But there are limits to the new policy. If customers are disruptive, employees are advised to step in. The company offered specific guidelines in a document shared with employees. The list of inappropriate behaviors includes smoking, using drugs or alcohol, sleeping or improperly using the restroom. Starbucks added that customers could be asked to change their behavior if they are unreasonably loud, watching something inappropriate on a personal device or their personal hygiene disrupts others. Starbucks advises employees to consider whether they'd be disturbed by the behavior in question if it was coming from a different customer. It also suggests that they consult colleagues to see if they agree that the person is being disruptive. If so, employees are instructed to approach the customer, while another employee watches, and respectfully ask the customer to cease the offensive action. If a Starbucks employee thinks the situation isn't safe, he or she should call the police. -- CNN's Yon Pomrenze and Nathaniel Meyersohn contributed to this report.